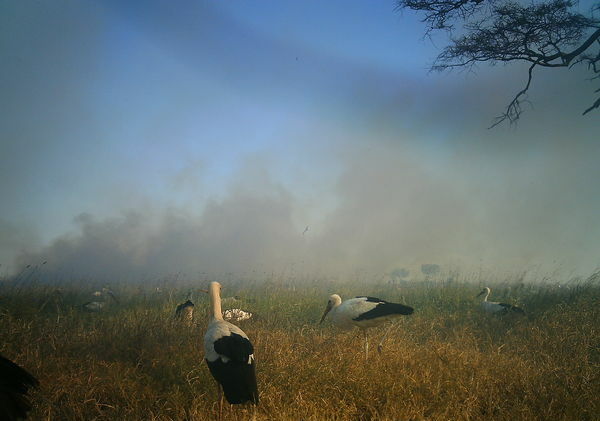 In the winter months (northern hemisphere winter, that is), we catch white storks on camera. They’re taking their winter vacation in the Serengeti — and across eastern and southern Africa. White storks are carnivorous, eating insects, worms, reptiles, and small mammals. A flock of them like this makes me wonder about the diversity of small critters that they eat that we don’t catch on camera. Because they eat small animals, they can sometimes be seen near fires, ready to gobble up those creatures trying to escape flames and smoke. The white stork has a favorable reputation with people in both Africa and in Europe, because it feeds on crop pests. In the spring, storks leave their wintering grounds and head north to Europe to breed. They build large nests out of sticks and are happy to do so on buildings and other structures with wide, unencumbered supports. And because they are considered useful — and sometime good luck — people allow them to build their nests on buildings. These nests are then frequently re-used year after year. Several years ago I went to Poland to find my grandmother’s childhood home. This was made a bit challenging because when my grandmother was a child, the area was part of the Austro-Hungarian Empire and the names of everything — towns, streets — were in German. These days, of course, all the names are in Polish. After finding a list of place name translations, I set out to see if I could locate some buildings my grandmother described in her memoirs in a small town in the countryside outside of what is now Wrocław and was then Breslau. 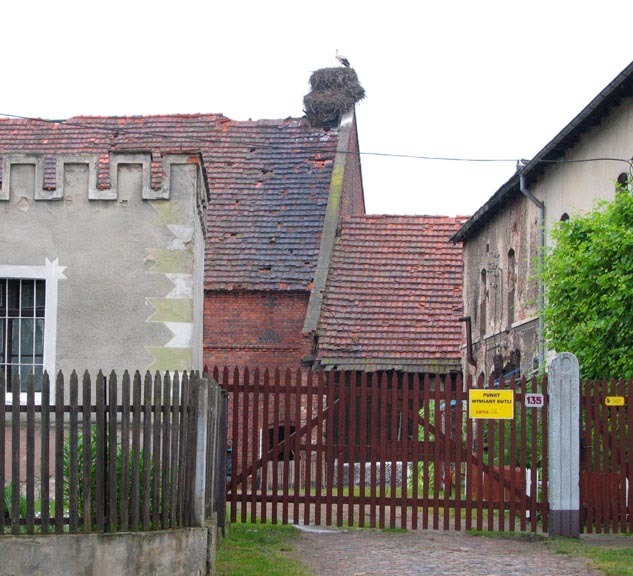 One of these was “Grandfather’s [my great-great-grandfather’s] water mill with its stork nest on the roof.” Sure enough, I found a large old building in the middle of town right by the stream. It no longer sported a water wheel, but there on the roof: a stork’s nest, complete with stork. Love your piece, White storks are so lovely to see. My husband is in Rotterdam this week and phoned to say that white storks where lining the electricity wires all along the road near the zoo one evening. I guess they where probably starting their migration. These kind of migrations make you realised how connected this planet is. White storks are very popular here in Denmark. They used to be quite common and it is estimated that in the mid 1800’s there were some 10,000 breeding pairs. However with the ever more efficient use of land for agriculture (including draining of wetlands/bogs) their numbers declined and in the year 2000, for the first time ever, not a single breeding pair was observed. Various environmental laws have since been passed to alleviate this situation and the white stork is now returning to Denmark, albeit ever so slowly. It is thus still front page news when the first stork arrives in the spring and even more so when (if) the first chicks appear!